Previous Pew Research Center surveys have found that one common association that the general public has for Mormons is “family” or “family values.” This survey finds that family is, indeed, very important to most Mormons. Mormons are more likely than the general public to feel that marriage and childrearing are some of the most important things in life. 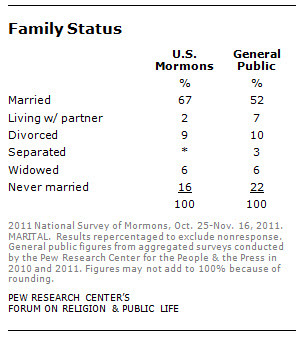 More Mormons are married compared with the population as a whole, and Mormons have more children on average than the general public. Finally, Mormons hold traditional views of gender roles inside the family and in their religious community. 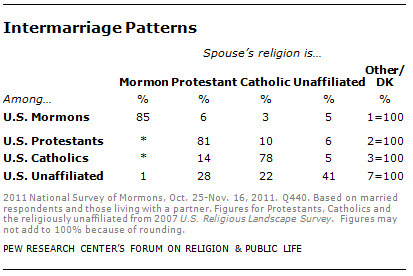 More than four out of five Mormons who are married or living with a partner (85%) are married to or partnered with another Mormon; 6% have a spouse or partner who is Protestant, while 3% are in a relationship with a Catholic and 5% have a partner who is religiously unaffiliated. By comparison, the Pew Forum’s 2007 U.S. Religious Landscape Survey found that 81% of Protestants are married to another Protestant and 78% of married Catholics are married to another Catholic. Intermarriage rates are higher among the religiously unaffiliated, 28% of whom are married to Protestants and 22% of whom are married to Catholics. 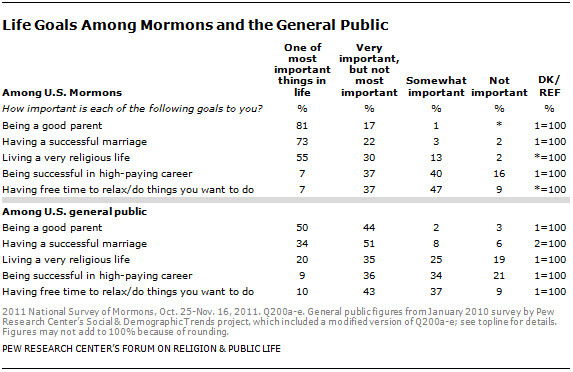 Four out of five Mormons (81%) say that being a good parent is one of their most important goals in life. Being a good parent also ranks among the top life goals of the public overall, though only 50% of the general population says that being a good parent is one of their most important goals in life. 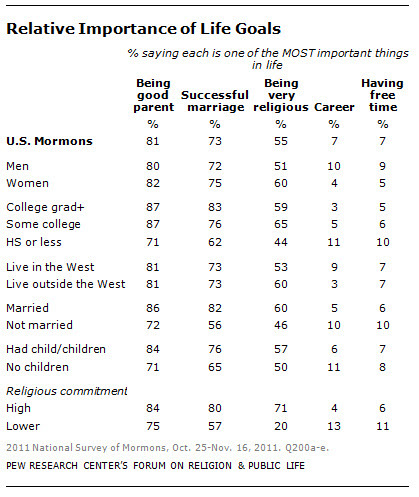 Nearly three out of four Mormons (73%) believe that having a successful marriage is one of the most important things in life, compared with 34% of the general public. For Mormons (as for the general public), this puts family concerns significantly above career concerns, having free time and even living a very religious life. This prioritization of family life is seen across Mormon subgroups. Being a good parent and having a successful marriage rank as top priorities in life for both Mormon men and Mormon women, and for both the highly religious and those with lower levels of religious commitment. Married Mormons are more likely than those who are not married to say having a successful marriage is one of their most important goals in life, but more than half of those who are not married (56%) express the same view. Similarly, those who have had children are more inclined than those who have not to say being a good parent is one of the most important things in life, but large majorities of both groups express this point of view. Those with higher levels of educational attainment are more likely than those with a high school degree or less to say that being a good parent, having a successful marriage and being very religious are among their most important goals in life. Nearly six-in-ten Mormons (58%) say that the more satisfying kind of marriage is one in which the husband provides for the family and the wife takes care of the house and children. About four-in-ten (38%) prefer a marriage in which both the husband and wife have jobs and both take care of the house and children. Among the general public, including many other major religious groups, the balance of opinion on this question is reversed, with 62% preferring a marriage in which both husband and wife work and 30% preferring a marriage in which the husband is the sole breadwinner for the family. Mormon men and women express similar views on this question, and there is no difference in views across age cohorts. Upwards of seven-in-ten Mormon college graduates (71%) say they prefer a marriage in which the husband is the sole provider, compared with 59% of those with some college education and less than half of those with a high school education or less (45%). This pattern is not observed among the general public. Married Mormons are more likely than those who are unmarried to say they prefer a marriage in which the husband works and the wife stays home (65% vs. 43%). And Mormons who have had three or more children are much more inclined than those who have had fewer children to prefer this approach, with 70% of this group saying they prefer a marriage in which the wife stays home and the husband works. More than two-thirds of Mormons (69%) who have high levels of religious commitment believe that the ideal family structure is one in which the wife stays home and her husband works, but only one-third of Mormons (33%) with lower levels of religious commitment hold this view. 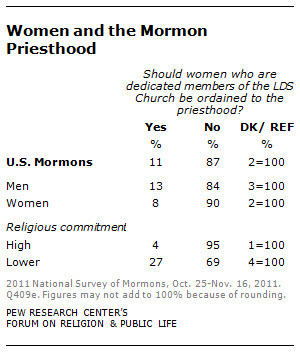 The survey finds little support for the notion that women should be eligible for the Mormon priesthood. (The Mormon priesthood is different than the priesthood in some other faiths; all worthy male members of the church are eligible to begin priesthood service when they reach age 12, and they may hold various offices in the priesthood at different stages in their lives. Mormon women are not ordained to the priesthood. See the glossary for more details.) One-in-ten Mormons (11%) believe that women should be ordained to the priesthood of their church, whereas 87% think the priesthood should be open only to males. Large majorities of both men and women express this view, but Mormon women are somewhat more likely than Mormon men to say the priesthood should be open only to males (90% vs. 84%). The belief that women should be ordained to the priesthood is less common among those who have the highest levels of religious commitment than among those with lower levels of commitment. Even among this latter group, however, nearly seven-in-ten (69%) say women should not be eligible for the priesthood.